Golf carts use 8 volt golf cart batteries, 12 volt or 6 volt battery packs. The 8 volt golf cart battery is the most common. Of course no golf cart runs on one battery like a car. They come in packs. Most battery packs are made up of 6 batteries. The total golf cart battery voltage for six 8 volt batteries is 48. 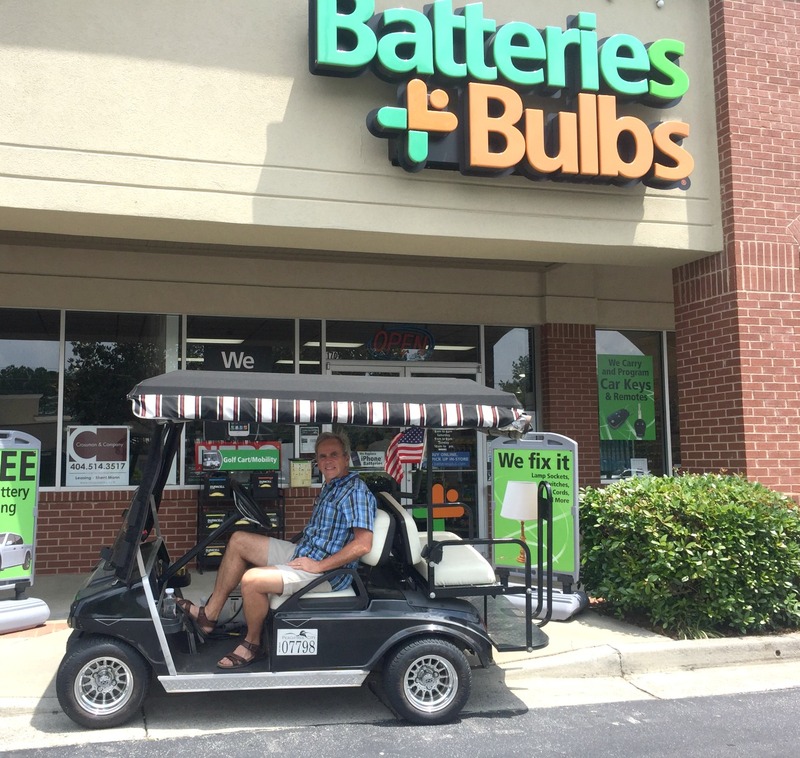 If you are thinking of getting a new Club car golfcart, they all use 8 volt batteries - 6 of them for 48 volts. A new EZ Go electric golf cart will use either six 6V golf cart batteries for a total of 36 volts or four 12 volt batteries for a total of 48 volts. You can tell if your golf cart uses 8 volt golf cart batteries by the number of cells or holes it has. Each cell is equal to 2 volts. 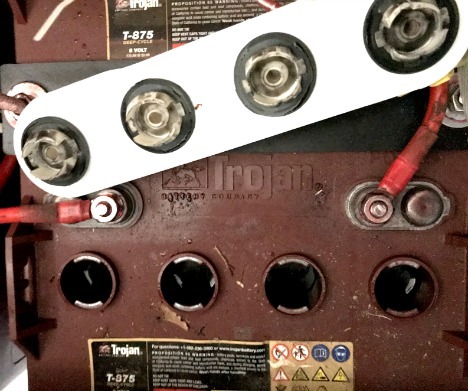 Multiply the number of holes by 2; so for this Trojan battery you see 4 cells; 4X2=8. So the battery pictured is an 8 volt golf cart battery. All new Club Car golf carts use six 8 volt Trojan golf cart batteries. 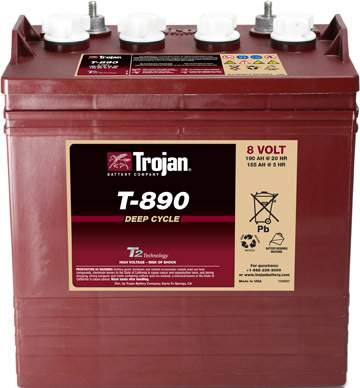 I was told by one dealer that if the Trojan batteries are well maintained using only distilled water, you may see them last 6-8 years. But another dealer said you can expect a 4-5 year battery life with Trojan. 1. Check the date code on the battery to make sure it hasn't' been sitting on the shelf for a long time. This can seriously affect performance. 2. Ask about the warranty. How long is the warranty and does it replace the battery or just pro-rate the replacement cost of the battery. 48 Volt or 36 Volt - Which is Better? 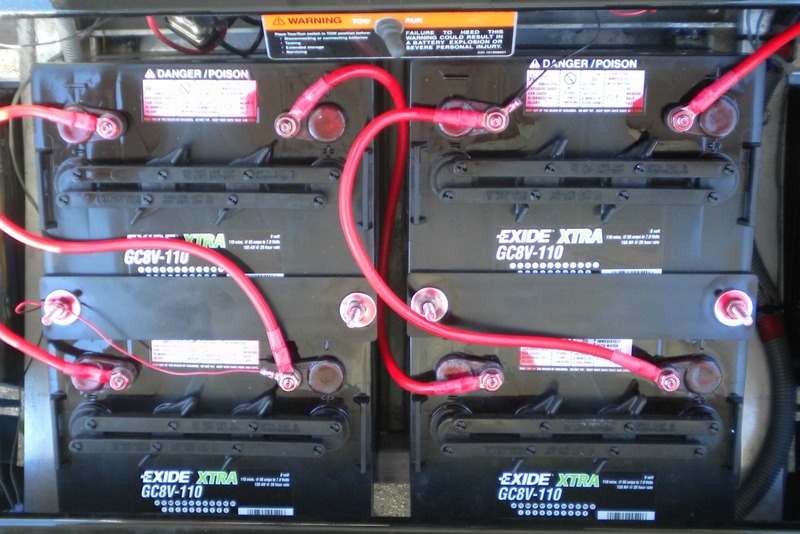 According to my golf cart experts at Affordable Golf Carts, 48 volt batteries use 1/3 the amperage than a 36 volt. Golf carts with 48 volt batteries are more efficient. They tell me that a golf cart using the 48 volts has a longer life than 36 volt batteries. This is good news for me, because I just upgraded my 1987 Club Car that used six 6 volt batteries for a 2006 Club Car that has six 8 volt batteries. 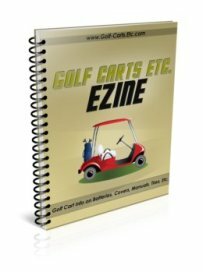 Other popular makes of 8 volt golf cart batteries are Exide and U.S. Battery. U.S. Battery boasts of their fast cycle up to full capacity, charges faster, and the batteries last longer. Electric golf cart battery packs will last between 4-7 years depending on how the cart is used, if proper charging practices are followed, and if correct water levels are maintained. Living in a golf cart community there are several golf cart repair businesses that will replace your batteries. We have also used Batteries and Bulbs when our batteries needed to be replaced. Other deep cycle battery buying options may include your local Napa Auto Store or Lowe's Home Improvement store. Golf Cart Garage website sells them but the batteries cost more when you buy them on line.